Last week I wrote about “The Role of the Church with Youth,” and I’d like to follow that up with things we can do to change the culture of our churches where we actually expect something of our young adults (youth). I really believe involvement is the key! We need to give them a job…not entertain our young people. I wrote an entire section about this in my book. So, why not include our 12 year olds in the adult choir? Why shouldn’t we be training and mentoring them in the various functions of the church (the Father’s business)? Certainly an older soprano in the choir can teach and mentor a younger soprano or an older bass can teach a younger bass. We do this at our church and it’s amazing to see the ownership the young adults have when they have a part or stake in what goes on at the church. The bond that grows between the older teacher and the young apprentice is special as well. When a young person has a job or responsibility, they feel they belong, then the church is no longer just their parent’s church. They say, “It’s my church.” You will hear them say, “I get to sing in the choir at my church.’” It becomes “my” church instead of just a place they are made to go. In our church, young adults can be ushers and greeters, help teach children’s Sunday school classes and work on local and even international mission projects (as we discussed last time). Young adults can attend any of our adult Sunday school classes, they help run the audio/visual equipment for services, work in Vacation Bible School, volunteer to serve meals to shut-ins, help prepare and serve and clean-up on Wednesday nights for our church-wide meals. They are being trained to play in the church praise band and regularly participate in our services in music and song, like our Passion Play. Let me state at this point: young people are not to become substitutes for adults. We recognize they are indeed young adults and they need training and mentoring. Rather, they are essential, complementary components to our more seasoned adults. Again, what we have implemented is what we see in that great mentoring passage in Titus 2, where the older teaches and trains the younger. We work very hard to provide activities that allow participation with adults in family-oriented settings. 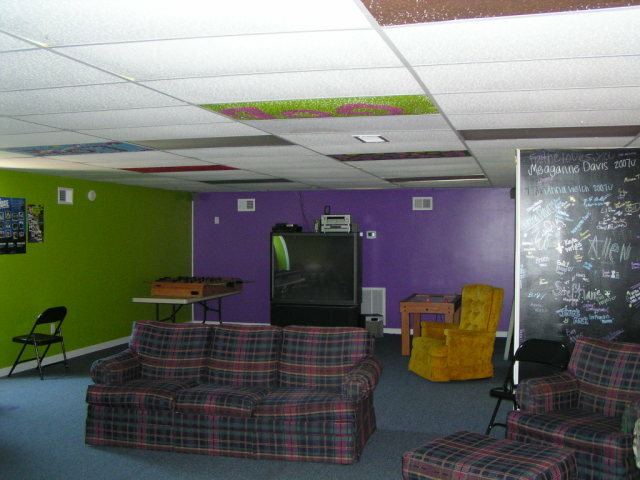 The goal is not to group the young adults together for play and entertainment. Doing so only reinforces to them that they have an identity separate from the rest of the adult community. I’m not saying God can’t work in youth group settings. 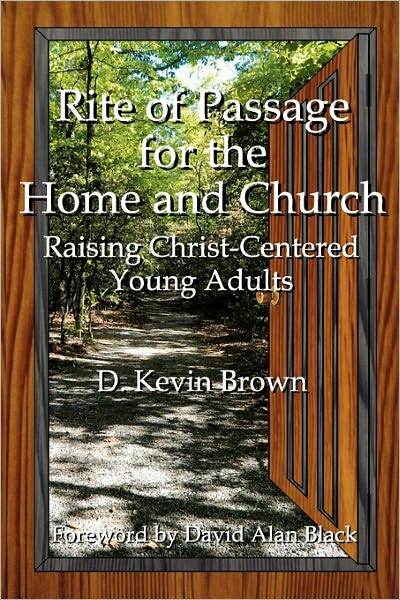 However, I’m convinced the Scriptural path of mentoring and giving our young people a stake in their church is a better way to accomplish the goal of raising Christ-centered young adults and easing the transition between childhood and adulthood. It’s obvious by the mass exodus of our young adults from our churches that “youth ministry” is not very successful. You see, we are involved in a war for the hearts, souls, and minds of our children and our families. I believe the Church is doing a terrible job of transmitting her religious heritage to the next generation. Sermons in many of our churches are now more “therapeutic” than instructional. Our worship services have become grounded more in what we feel than in what we know and understand about Scripture. In many cases we have stopped training and discipling our people. Why is it that the Church, in many instances, no longer represents the power of the action of God in the world? We have compromised the gospel of Jesus Christ. The Church has quit training and evangelizing and it is literally dying a slow death in America. This slow death is akin to the proverbial frog in the kettle that slowly has the temperature turned up so that the tepid water eventually boils him to death. We are being boiled to death by entertainment, “spectatorism” and a cheap, prosperity gospel. Church attendance continues to drop nationwide and we have forgotten the goal of advancing God’s kingdom on earth, instead of our kingdom. The purpose of the Church is to be God’s missionary people in the world. We are to be Jesus’ ambassadors (2 Cor. 5:20). He’s expecting us to make His appeal through us! We are to be adding disciples to the flock, not just fattening those that are already in the flock with entertainment, and fun and games that offer little substance each week. For many in the current generation, the Church is seen as fractured, segregated, watered-down, and devoid of any cultural relevancy. What passes for Christianity and true discipleship in many of our churches is often just a faint shadow of what the Scriptures actually teach and admonish the Church to be. The typical teen in an American church feels little or no sense of ownership in their church simply because they do not feel they are a part of that church. My prayer is the Church will get back to being the one Church and function as a complete body again. Leaders, I want to encourage you to involve your young adults in the church. Discourage peer association at times when the worship service is taking place if it is deterring their discipleship or ability to listen and learn. It is sometimes necessary to discourage young adults from going to the back of the church and sitting together slumped down in their seats. Encourage families to sit together. There is plenty of time to socialize with friends before or after the service. What is the purpose for being at church in the first place? It’s to be trained and equipped while being edified and encouraged. If you have a youth ministry at your church, or you are a youth leader, seek to embrace the facilitator role of bringing families together and seek to minister to the entire family. 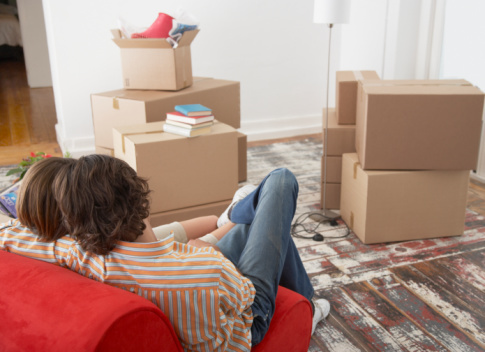 No longer should you see yourself in the role of having responsibility for raising young adults, instead seek to get the message across to the parents that you are transferring this responsibility back to them. A good intermediate step, (we are doing this at our church), is to have parent/child Bible Studies or Sunday school classes. The youth minister can begin these classes, but gradually hand them off to the parents. 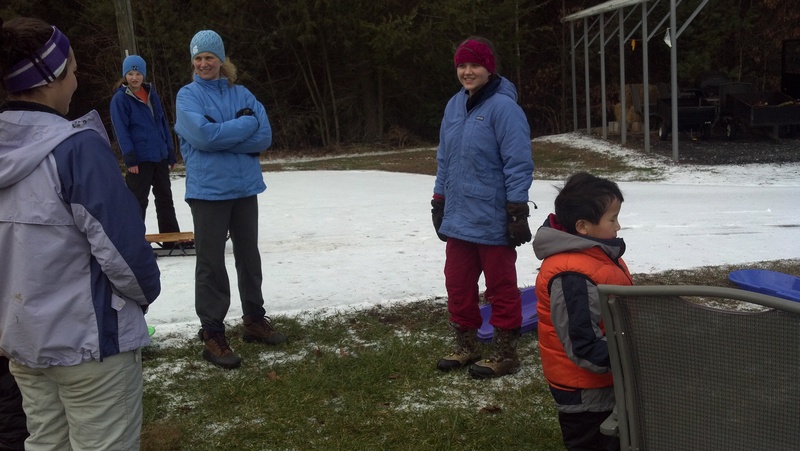 Again, if there are activities to be planned like an outing to go ski or ride bikes, plan it as a church-wide activity. We don’t have a “youth” committee at our church. We have a “family” committee. We plan activities for the family that will reach out and impact other families in our community. It is important to get outside of our four walls and no longer just tithe to ourselves, but spend that money on reaching people. Everyone needs to be involved in that process and that certainly includes our young adults. So, let’s give them a job! And when we do, they’ll want to be at church and they will become a productive part of “their” church! Well, most churches have asked that question and have come to the conclusion that they must be a substitute where the dads are not getting the job done. Thus, before we realized it, the Church was handling the training for all dads, Christian and non-Christian alike. But, this is a problem. For the past 30-35 years, the Church has undertaken a role that was never intended for the Church to do in the first place. Instead of getting our hands dirty in the hard work of teaching and training, we often want to take the easy way out and hire someone (a youth pastor) to do it for us. It seems the Church has stepped in to do what we don’t have time for or the appetite to do ourselves. But what do we do when there is a father in the picture who is not a believer or is unengaged spiritually? What about the young adults who have no family in the church? What do we do about them? To answer these questions, we must turn to the teaching of Scripture. We can simply “adopt” these young people into our families. We can mentor them. This means inviting them to sit with of our family during service and making them feel they are accepted and belong. 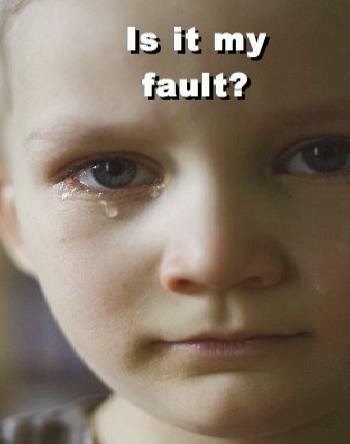 Problem is…in many churches today, the youth are never in the service with the “adults.” This is tragic! Paul instructed Titus to teach the elders in Titus 2 that the old should teach, mentor, the young. How can we do this if they are never with us? 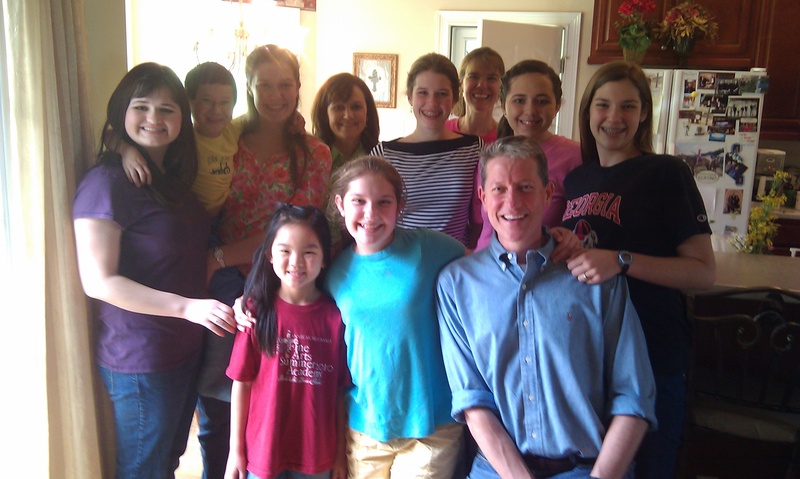 Through the years, Pam and I have “adopted” several young adults into our family. One of which is now our son-in-law. 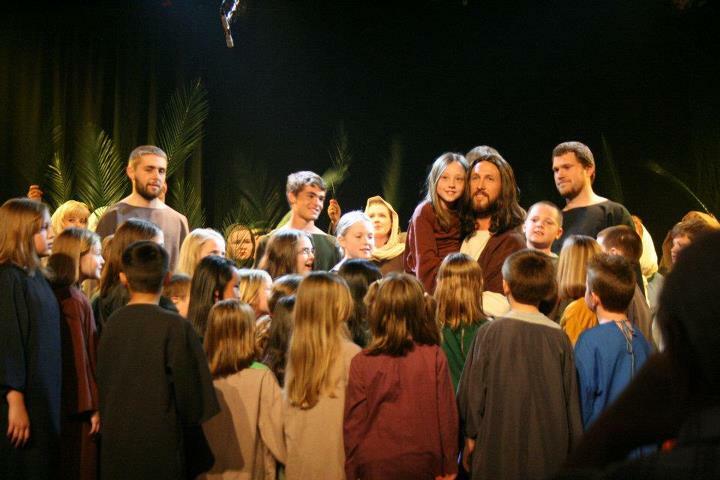 We have tried to model and exhibit what a biblical family is to look like. We plug them in to our family life and we try to show them what a Christian family looks like. The most important part of this process is simply to show them love. I believe it is time to get young people out of our game rooms and get them plugged into our churches and get them on the mission field of life. We need to see our young adults as capable of “being about the Father’s business.” We need to expect them to step up to the level of a teenage apostle or Timothy or David. Does offering more concerts, camps, lock-ins, pizza blasts, zip-lines, ski trips, and the like stand to give us spiritually mature young adults? No, not if that’s all we give them. A steady diet of activities and fun is not what they need or want. Our society’s youth orientation has bred little more than young adults hyped up on the junk food of entertainment and fun, yet they are starving to death and dying for answers to the difficult and tough questions of the day. Our young people sit in our churches week after week and we see them, but are they really there? Are they really engaged? Do they want to be at church or are they just coming because they have to or because they’ve been lured by the fun and games? Doesn’t our focus need to change? If you think about it, of all the programs in churches which one is most commonly the largest and well funded? The answer: youth programs. It seems that evangelical churches, and many mainline churches, began breaking out the youth in their congregations about 30-40 years ago. In fact, there is a feeling in Christendom that you aren’t doing too well as a church if you can’t fund and hire at least a part-time youth minister of some sort. 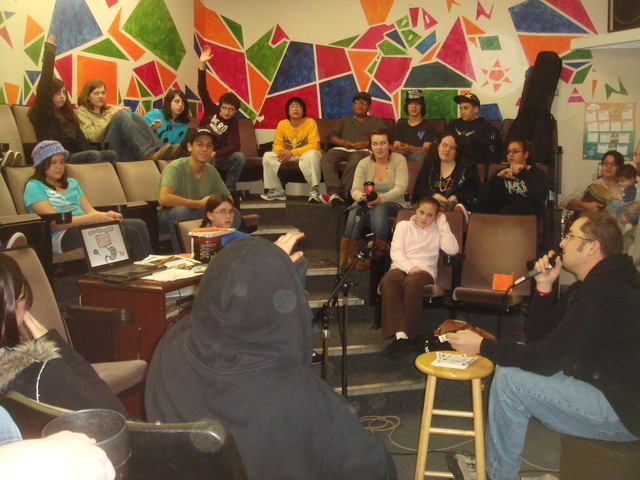 But, what do youth ministries do? Many of these programs, if not managed carefully, can breed immaturity because they hinder younger people from associating with and learning from their elders. Paul told young Timothy to “flee youthful lusts” (2 Timothy 2:22). Yet, it is common to take the young adults on an outing at night and we have to station chaperones throughout the church bus to make sure everyone is being nice. Is that something we should have to be doing with adults in the church? There should never be a youth function in a church in which everyone, young and old alike, cannot participate. When we go skiing at our church, anyone can come along. When we go ride bikes, any member of the body can and should be allowed to attend. We do mission work as a church family…we never take “youth mission trips.” We do the work as a “church family,” young and old alike. When we totally separate our young adults from the rest of the church body, we are setting them up for an identity crisis. They don’t know who they are apart from their friends and buddies in the youth group. They know nothing of the functioning of the church, as a whole, outside of their youth room. After all, they have their own culture and music, geared to their own tastes. So, by the time they are 18 and we tell them they must leave our youth groups, they are sent to the grown up church where, in some cases many have never been. It is culture shock to say the least! Despite all of this, some may think that we are trying to take the fun out of the lives of our young adults. Some say, “They’ve got to be kids. Let them have a little fun.” Please understand, I am not against anyone having fun, but is this the role of the church? Are we supposed to set up our churches to be centers for having fun? Somehow we think teenagers are entitled to more fun than anybody else in the church. We feel we must put something fun on the calendar every week or two, certainly monthly, so they can have a good time. Do we owe any group in the church a good time? Many youth ministries seem to be run like a cruise ship. We hear things like, “When’s the next event? What are we eating, pizza or hotdogs?” No wonder we have such a high turnover rate with youth ministers. It is easy to burn out after two or three years of this kind of activity planning. Can youth groups be a negative influence on our young people? Yes, unfortunately, I believe, (certainly without meaning to), they can. You see, we place our young people in these peer-driven groups where the spiritual maturity is usually very low and yet we desire for them to grow spiritually. How? How can they grow spiritually in these environments? Most of the time, youth pastors are trying to administrate some sort of crowd control versus being able to really teach. Unfortunately, our young people tend to find their identity in their friends or what they wear, drive or have. Some young people have their entire identity wrapped up in the type of clothes they wear, cell phone they carry and who they are dating. This same mentality often transfers into our youth groups and can even be fed within the youth group. …put up posters of Christian musicians, many of whom honestly look like leftovers from the 70’s group KISS, and bring in sofas for them to lounge on while they play video games and hang out. 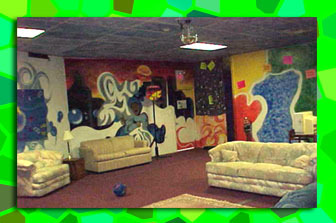 Some youth rooms I’ve seen look more like arcades. Some churches have even given their youth their own building, where they come for an entertainment smorgasbord anytime they want. Is this the structural model we really believe is going to grow mature, solid, faith-filled, Christ-centered, young adults? We must stop kidding ourselves. The numbers, the surveys, and the statistical data do not lie. Many of our young adults continue to abandon their faith and will continue to do so unless we change our strategy and return to a Biblical model. It seems okay for us to give them a driver’s license at 16 and put them behind the wheel of a 5,000 pound vehicle and turn them loose on our highways. We expect them to learn algebra, chemistry and calculus. Certainly, they can study and learn Scripture as well. Our young people need to be with adults and be trained older to younger. In fact, they will graduate from high school and college and go to work in environments with people of all ages. Only in our schools and churches are our young adults segregated by age. Remember, Paul mentored young Timothy, who was likely in his teens or early twenties. Paul poured his life into Timothy (See 1 and 2 Timothy) and we should be doing the same for young people in our churches. This practice is much more effective than youth programs at large, which are mostly peer driven. The power of mentorship and the mentorship process is a fundamental ingredient in the Scriptural model that will have a major impact on training and preparing the next generation to carry forth the teachings of Christ. If we can’t get the gospel to the next generation by properly handing off our faith in Chris, then the Church will become impotent and useless. It doesn’t matter what we do with budgets, mission statements, planning committees, and the like. If we don’t transfer our faith in Christ to the next generation, Christianity in America will go the way of Europe, where many of Europe’s beautiful churches have now been turned into pubs, bike shops and municipal buildings. The Church is to help and partner with the family to grow our young adults in the way of the Lord. We are partners with the family in training our young adults. Again, we don’t do the job for the parents, but partner with them. The church’s vision must shift from a consumer-driven focus regarding our young people, to a partner-driven focus. In other words, the church must stop seeing itself as a vending machine of fun activities to give young people or children something to do to keep them out of trouble. As parents, we must stop seeing the church as a place where we drop off the kids to let the pastors train them or give them a little faith development. This consumer mentality, where we come to church and feed ourselves at the “program” feeding trough, needs to change. We must return to the Scriptural mandate that the older should teach and train the younger. We must stop thinking the church building and its programs are the conduits through which the gospel is spread. The gospel is spread through people, not programs. What programs existed in the first church? None that I know of with the exception of meeting together to fellowship, break bread, study the gospel and pray (See Acts 2:42-47). 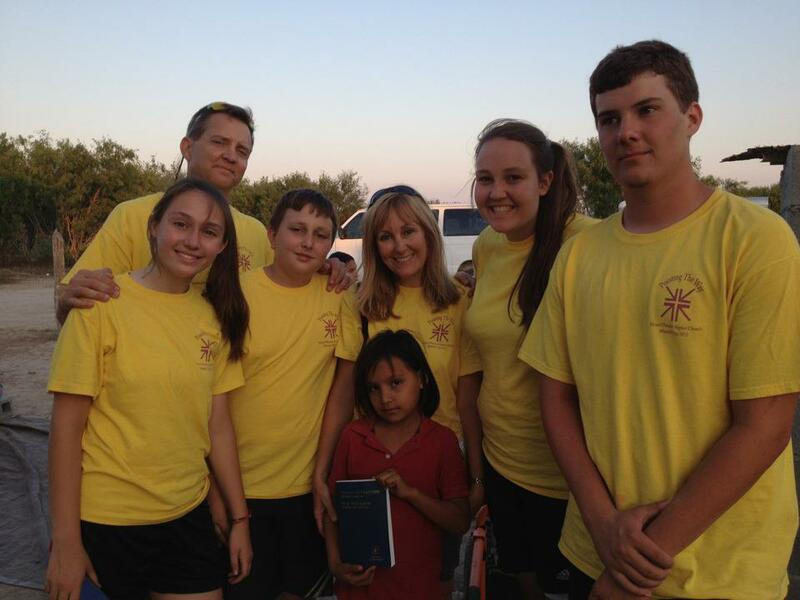 Afterwards, they left each other’s homes and went out into their community and shared Jesus. The gospel must travel house by house through the community in the same way it did 2,000 years ago. If we want to have programs, why don’t we set them up to follow the principles outlined in Scripture? So, for the wonderful family that joined Sunday, YES, they get to worship together and NO, we won’t seperate them as soon as they hit our doors. And no, this is nothing new. This is simply returning to the ancient paths of Scripture (Psalm 78). I must tell you it will be a long time before I forget room 206 at the Comfort Inn in Garner, NC (near Raleigh, NC). Is it because the room was so nice? Well, we had a nice room but, it wasn’t the Biltmore House by any means. No, the reason is not because it was such a wonderful place. 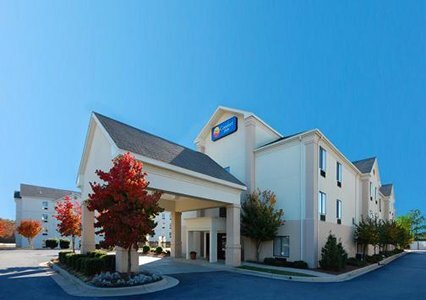 The reason I will remember room 206 at the Comfort Inn in Garner, NC is because of what happened in that room for 2 days. 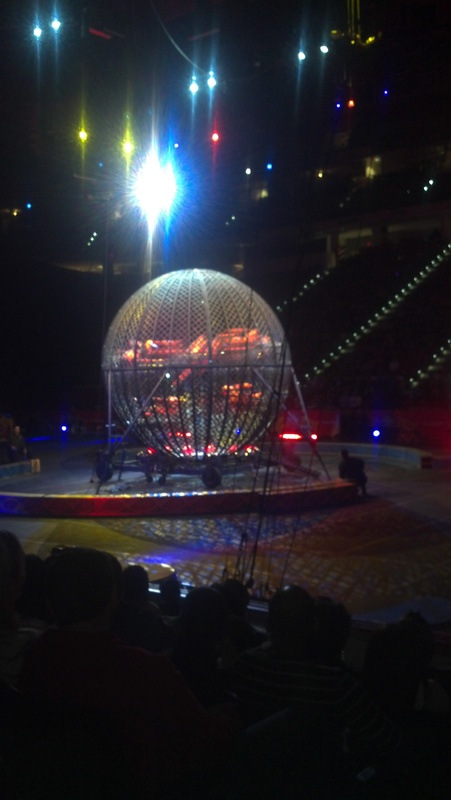 Well…off to the circus! 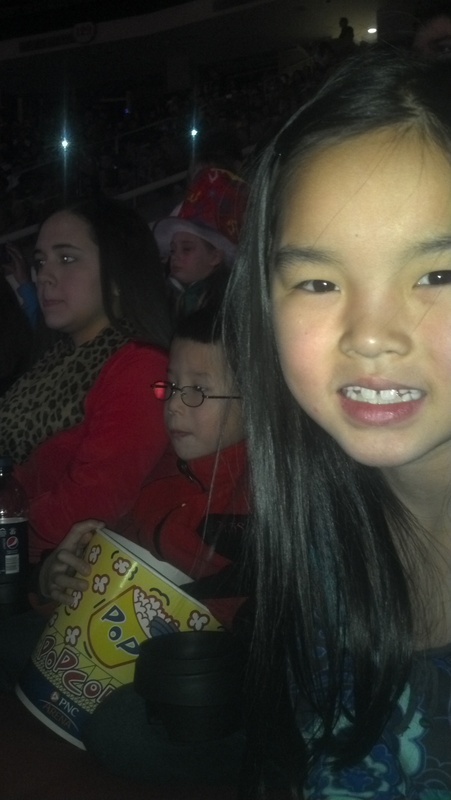 Clara and Andrew had a blast! And this would be the last smile we would see for a while!! 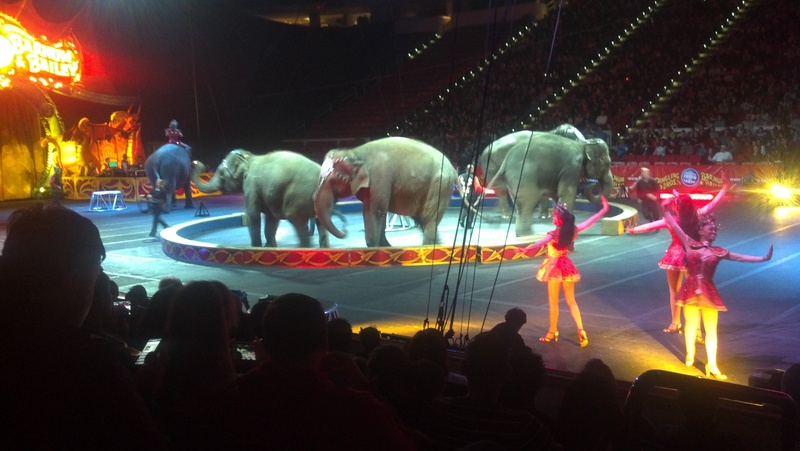 The circus was at the PNC Center (where NC State plays basketball). Well, by the time we got back to the hotel room, Pam was white as a sheet and said she felt terrible. Minutes later she was in the bathroom with the stomach flu. Let’s just she was hit with the double-whammy of the flu. This was about 10:30 pm. Well, a couple of hours later it was Kandace and then about 3 am it was Clara and then by morning, it was me and then finally Andrew. Needless to say, we were keeping that one little bathroom busy. In fact, (sorry to be graphic), we were glad the sink was not in the bathroom. It was located in the entranceway to the room. This was truly a God-send. With five people being so sick with three of the five of us being hit with the “double-whammy,” we were grateful for a detached sink. Ok…enough already! You get the picture. Are you serious! Be thankful that we are all sick as dogs and we’re going to miss seeing Katy and Josh and we’re in this “hole” of a room in Garner, NC. Be thankful! Come on, Lord! And then I thought of the Apostle Paul and Silas in the jail in Philippi in stocks. They were singing praises to God at midnight. I thought of David running from King Saul and Psalm 37 where David praised God. I thought of persecuted Christians throughout the world in prisons. I thought of believers living in third-world countries eating a handful of rice every other day and barely being alive. 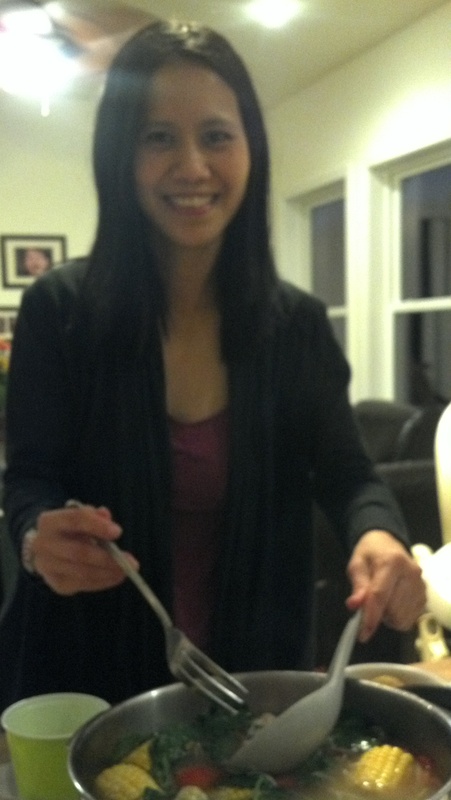 And yes…I was thankful! I was thankful for room 206. A room where we were all together. We could help each other. We had comfortable beds to sleep in. We had a vending machine where we could buy Sprite. We had Tylenol for the fever and we had wash cloths to lay on our foreheads. And yes! We had the Lord to comfort and speak to our hearts, “I’m here!” The Lord reminded me that He’d never leave us nor forsake us. He reminded me that His grace is sufficient. He reminded me that His mercies are new each day! I don’t think I, nor my family will forget room 206 for a long, long time. It was there that we experienced the presence of the Lord and the love of family. All we had were each other and the Lord and you know what…that was enough. Are you in room 206 in your life? Are you going through a difficult season? Do you think it will never end? It will. It will!! God will deliver you! He’ll either deliver you “out” of the trial or “through” it! Either way…you are coming out on the other side. He’s got you! If you know Jesus, then you are in the hands of the one who created you for His glory and He will not let you down. EVER! Room 206. Last week at this time I had lost so much weight I was back down to my high school weight of 185. Pam and the kids were the same. Yet, we walked into our home Tuesday afternoon last week to our home (germ free…mind you :)) and we were all wobbly…but, grateful. And one week later, I can look back on our experience and be even more grateful for a wonderful family and a wonderful God. Oh by the way! 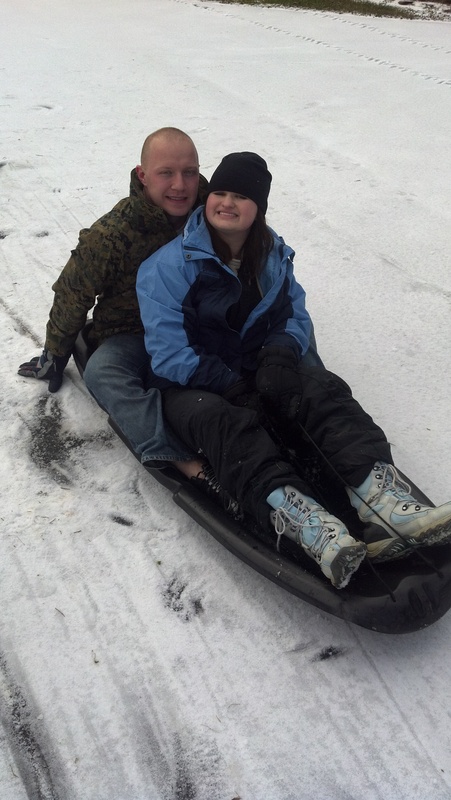 I have a wonderful daughter and son-in-law, because they came home last weekend since we couldn’t go to them. I really thank Josh for that! He knew his wife was very disappointed and so he worked it out to get her home to see her family. Josh, you are the BEST! I mean that! I’m so honored and thankful you are my son-in-law! There’ll be more difficult times in this life. More 206’s to come. But, you know what? I’ll remember Room 206 in Garner, NC and I’ll be encouraged and confident in the fact that God is in control and no matter what…home (heaven) is waiting! Last time we talked about divorce and the terrible impact it has on the family. Part 2 is about: Living together, also known as “cohabitation.” Folks who decide to forego marriage and live together…no strings attached. It’s a common thing today. In Winston-Salem, NC for instance, over 50% of those under the age of 30 live in homes where marriage hasn’t occurred. According to the study cited last time (“Does the Shape of Families Shape Faith?” conducted by the Institute for American Values) by the time a child in America turns 15 years of age, 40% will have lived in a cohabitation relationship with more than 8% experiencing three or more maternal co-residential relationships. The report concluded children from these homes, compared to those from intact, married families are more likely to suffer from a range of emotional and social problems such as drug use, depression and dropping out of high school. Cohabitation can also be more dangerous for children. The data shows children are at least three times more likely to be physically, sexually or emotionally abused in cohabiting homes, compared to children in intact, married parent homes. It is obvious that the institution of marriage has been taking “body blows” from the culture for years. TV shows called “Happily Divorced” and “Desperate Housewives” prove this point. Amazing! That’s the only word I can think to type! Amazing. But perhaps even more amazing to me are the Christian families who gloss over their children and grandchildren’s choices about cohabitation with little more than a wrinkled forehead when told of such. Now am I saying that they should disown them and be mean, angry and unloving? Of course not! That’s not Christ-like at all. But, Jesus told the woman caught in adultery to “go and sin no more.” We’ve stopped just short of that and rationalized “Well, it’s just a different day than when we were young. I guess times have changed.” Truth is…both statements are correct, but God’s Word hasn’t changed, neither has He. So, what do we do? Does the Church in America just give up on marriage and holding up the truth of God’s Word because it’s hard? No! We must continue to share a reason for our hope with gentleness and respect. We must tell our loved ones and friends that what they are doing is against God’s commands. Yet, for those children caught in these cycles of divorce and cohabitation, the Church must be there for them. We must take in and mentor these children. As I was growing up I had several men in my life that helped mentor me spiritually, including my grandfather, C.M. Brown, and uncle, Curtis Greene, and a godly pastor, Jimmy Hubbard. I also had a wonderful, older friend (by three years), Steve Bryan, who helped me many times by just being there to listen. When it comes to role models and mentors, young people don’t really care who you are, what you look like, or what you do for a living. They just want to know you genuinely care about them and will listen to them. I’ve learned if you cannot listen openly and entertain a young person’s questions, then you will most likely fail in helping them. Who is in your church that needs your help? What young person needs a friendly ear? Particularly young teen boys need a godly male in their lives. This is such a critical need in our culture today. Look around sir. Who’s out there that you could help mentor? Remember, as you are thinking about this, the majority of conversions occur between the ages of 7-16. This is nothing new. 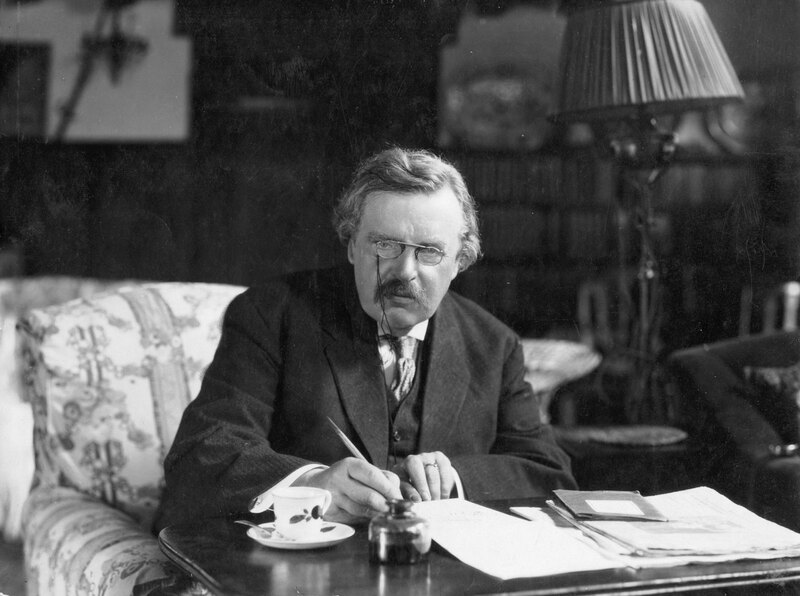 G.K. Chesterton saw this coming 100 years ago. The Church must be the pillar and buttress (fortress) for the truth. If the world won’t hear the truth from us…where will they hear it? So, let’s be ready to tell the truth and to help those families struggling with divorce and cohabitation. Let’s not condone the lifestyle, but let’s not shove them to the curb. Let’s love and Jesus loved and encourage them to “go and sin no more.” Let’s remind them that Jesus came to die for all sin…yours and mine. Let’s reach out with the hands of Jesus (pierced because He loves so much). May we seek and save that which is lost. May we be His Church…a people who are known more for Who we love than what we hate (the sin). I must tell you at times I feel like a “voice crying out in the wilderness.” Often I use this blog to announce and signal alarms within the “Church” and within “Christendom.” Perhaps this is just my nature. Pam often tells me that I act like the “General Manager” of the world. 🙂 That may be true…at least in part…but, I pray that my concern comes from a heart of love and from a sense of urgency to see people come to Christ and know the truth. One of the areas that has really popped up in my heart and mind lately is an area that I believe it’s time for people of faith to talk about and recognize. What is this topic? The absolute blindness within the Church today regarding the effects of divorce and cohabitation on our children. In this post I’ll talk about “divorce” and in a subsequent post, I’ll pick up on cohabitation (even though I will touch it briefly here). Today we continue to sweep divorce under the rug. And I must tell you the reason divorce and cohabitation are such big issues in the church today is because of our casualness toward marriage and the splintering of the family. The nation is in the shape it’s in today because the family is broken. Well, please understand that I’m thrilled a life is going to come into this world and an abortion is not going to take place. But, what happened to marriage? What happened to the conviction that having babies outside of marriage is totally counter to Scripture? Why is it no longer important in our society to marry? Recently I read a report published by the “Institute for American Values” conducted by the University of Texas at Austin and the University of Chicago Divinity School called, “Does the Shape of Families Shape Faith?” The subtitle of the study is: “Challenging the Churches to Confront the Impact of Family Change.” The report grabbed my heart and wouldn’t let go! 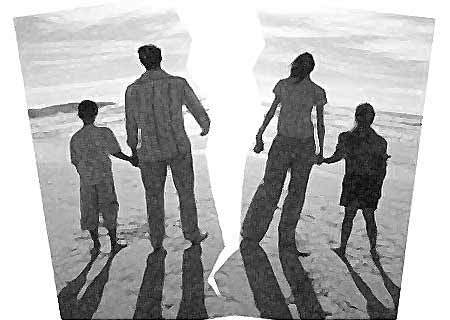 I want to share some of what I learned in this fascinating study about what divorce and cohabitation are doing to our children and adults. First of all, you know that divorce statistics within the “church” are basically no different than in the world. About a 50% divorce-rate continues to exist in this nation. Granted…I will say this now…I know this is a very, very touchy subject and an issue that is a difficult and thorny to address, but it must be brought out into the open and discussed because of the impact it is having on us all. Now, I know that many of you who are reading this blog have come from a home of divorce. Perhaps you are a child of divorce or you have been divorced. Only you can know the series of emotional and even spiritual hurt and trauma divorce has had on your life. With that said, I want to be careful and sensitive in what I describe from the report to you; yet, I will not “sugar-coat” it. 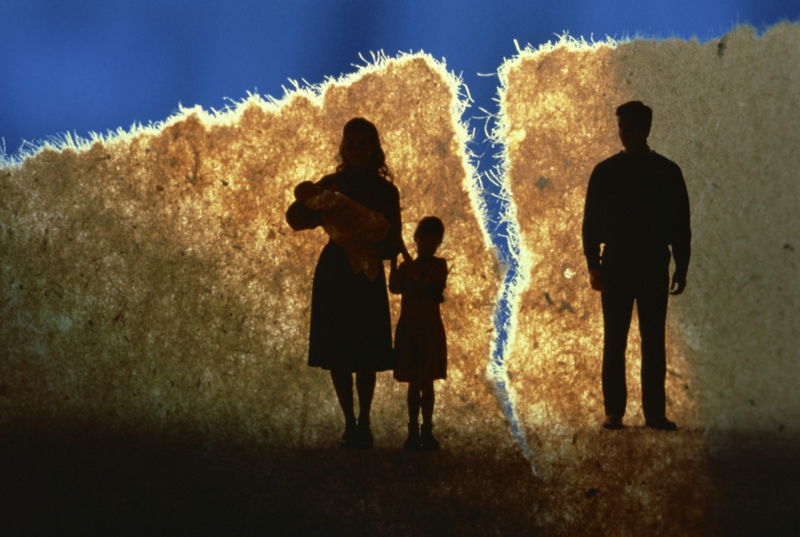 Today in our nation, one million children will experience divorce in their home each year. And yet, little attention is given to how growing up in a divorced family might shape the religious lives of those young people. In the report, it indicates that only 25% of children who grow up in divorced homes in America will go to church in their adult years, versus 66% of children who grow up in homes with parents who stay married. 25% versus 66%!! That’s a HUGE difference! What’s more, did you know that more than half of all children born to women under the age of 30 are born into homes where that woman is not married? In the study, it indicates the greatest predictor of the religious lives of a young person remains the religious life of the parent. Dads, listen up! The research shows that “divorced fathers are especially influential in whether their children will continue to have a life in the church.” Often a child’s earliest images of God are a reflection of their “earthly father.” Interestingly, the study found that “grown children of divorce stand at the leading edge of a generation that considers itself ‘spiritual but not religious. '” It’s so heartbreaking for the children. They often live with such guilt. According to the stats, divorce has a “sleeper effect.” It’s worst symptoms often appear when children of divorce leave home and attempt to form intimate relationships and families of their own. Often, they do so with less ability and less trust and little idea of what a lasting marriage looks like. We know that when a marriage comes apart, a child’s way of life is split into two lives. In the study, there is a brief excerpt from the life of a lady who tells about the night she learned of her mother’s adultery. But, I know what some of you might be thinking. Well, sometimes there are irreconcilable differences or there is abuse and the divorce is necessary. Well, I will tell you straight out that I certainly don’t advise a lady staying in a home where she or her children can be abused in any way. But, everyone always wants to talk about the extreme of a situation it seems. Yet, in this space of blog-time, I simply want to talk about the mass exodus I’m seeing by couples who just flat-out quit on each other because they supposedly “fall out of love.” I often ask people, “Is that like following off the couch?” You see, “love is a decision.” Love is more than just “feelings.” TV, music, movies, etc., paint a much different picture of love, however. Even next week with Valentine’s Day, we will see a “false” idea of true, sacrificial love. We will only see the infatuation side of love that’s all about emotions. Yet, when you talk to the children themselves, you find that the popular idea behind the “good divorce” is actually an “adult-centered-vision” that does not well reflect the child’s feelings and experiences. Bottom line. 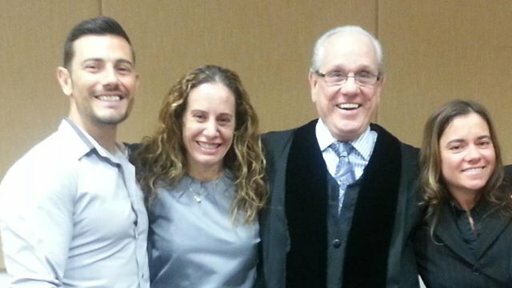 While a “good divorce” is better than a “bad divorce,” it’s still not “good” because it is still a splitting up of the family. No matter how amicable divorced parents might be, and how much they each love and care for the child(ren), their willingness to do these things does not resolve the situation that a child’s world is now divided in two. So what do we do? Is this just a guilt-trip for those who are reading this who are dealing with divorce? No. This is not intended to be a guilt-trip for you. But, this is to be a warning signal to those who are currently STILL married and are discussing divorce (and you have children). Hear me! Don’t do it!! It’s not worth it! You are going to have to work like dogs outside the bounds of marriage (if you choose to divorce) to keep things going “smoothly” with your kids. You will have to coordinate with the former spouse times the kids can be picked up (assuming joint custody of even limited custody). You will have to decide about vacations, holidays, birthdays. Do you see? You will still have to “work together” to make all of this happen. If you think a divorce is the answer in not having to deal with that person (your spouse) ever again, you are FLAT WRONG! You will be dealing with them (because they are the parent of your child) for the rest of your child’s life. So, why not put the same effort into working out the issues and problems that you will outside the marriage? Either way, you are going to have to work like dogs to get it done, so choose the best for the child! If you come from a divorced home and you are dealing with the fallout from that (from years gone by). Or perhaps you are divorced and have children in the home, please know that “all is not lost.” God is a good gracious, forgiving and merciful God. He will help you and your children through the difficulties. He will never leave us nor forsake us. We know that, but I think you need to hear that again. Please understand, this blog post was to sound the call to the young families who are still together. 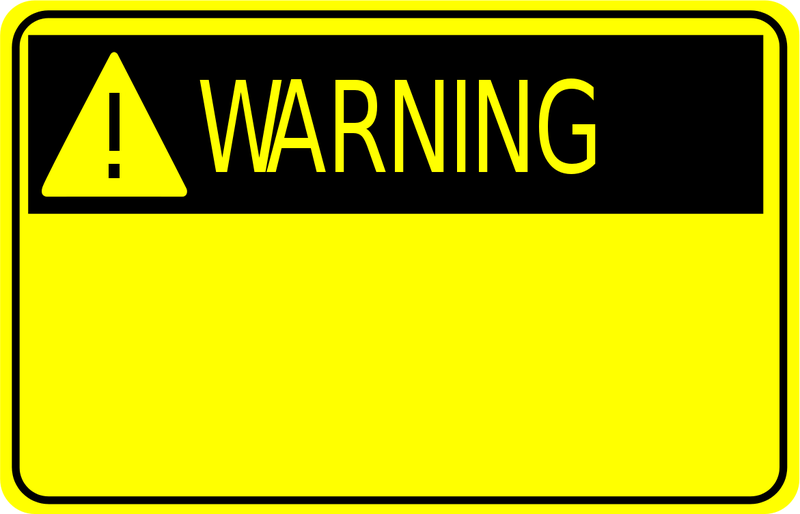 This is a shout of warning! Will We Get Any More Snow? Sometimes there’s not much in the old brain after a busy day. So I thought I’d just pass along some family stuff and talk about the weather. Nothing high-level tonight. Being a novice “weather guy,” I’ve been getting the question a lot lately, “Will we get any more snow this winter?” Well, that’s a tough one to answer. We’ve had some negative factors working against us, if you like snow, (which I do!). We have a La Nina, (means “little girl”), pattern going this winter. We have our best winter’s with an El Nino, (means “little boy”). pattern. Again. El Nino patterns give us warm moist waters off the western coast of South America. A La Nina pattern gives cooler waters off the same coast. That doesn’t bode well for an active southern branch of the jet stream coming out of the gulf. We need that active southern jet. Well, we’ve had some decent activity in the southern jet over the last month, which is atypical of La Nina. So, we can get some aberrations from the norm in a winter. With all that said, we also need a cold northern jet stream to pull cold Canadian air down from the arctic. We’ve struggled to get that this winter. There have been no blocking high pressures off the coast of Greenland. We had that one fairly large cold snap for a few days two weeks ago, but that’s been about it. 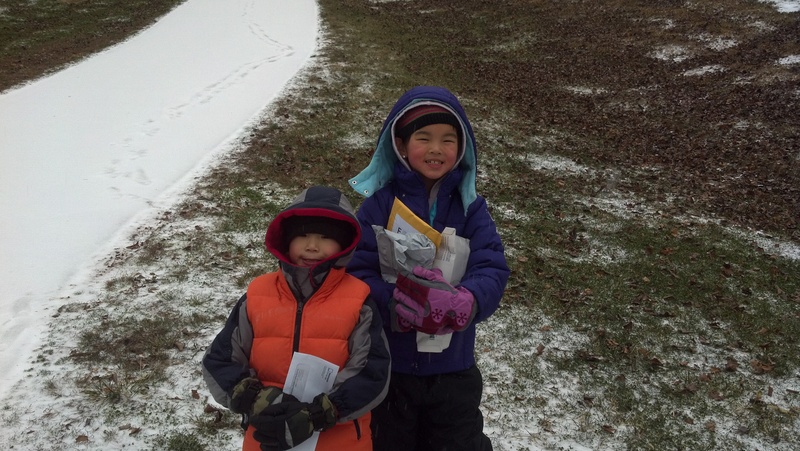 We have had almost no snow this year and we average about 12 inches per year. I don’t see us hitting that number, but I do think we have a shot at some other anomalies. Anything can happen with a rogue, coastal storm. The northeast is going to get one this weekend and Boston could get a foot of snow by Saturday night. 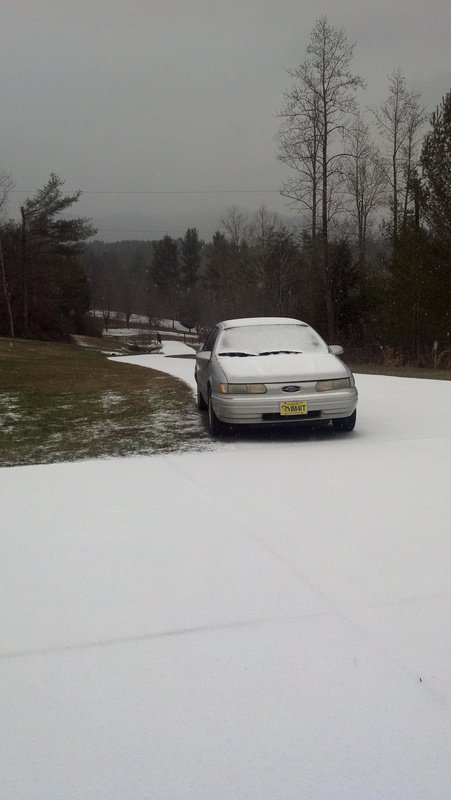 So, winter is not over, (even though the Groundhog saw his shadow this past Saturday :)). In fact, the Almanac is indicating for Feb. 12-15 (which coincides with the Weather Channel above) that: “Major northeast snowstorm develops…Snow for Western N.C. I’m not jumping on board with it yet, because I don’t see enough cold air. I believe the Weather Channel will change this forecast and go for just rain next week. However, there is some cold air building to our north, if it can just get injected our way. He hints on his blog video today that there is cold air building for later in the month. So, we’ll see! I believe we’ll see another snow, or is that just wishful thinking? 🙂 It’s going to be a tough “timing thing” to get the moisture and the cold air. Often we get the cold air and then no moisture or just the opposite. That’s Leah and that’s the “Sled of Death.” An “old-timey” sled that is wooden with metal runners and a steering triangle at the front that didn’t steer for me! It’s FAST! And I was heading (it seemed like 90 mph) toward a rock and I slammed it with my right foot. My foot stuck solid on that rock (I didn’t want to roll off for fear of hitting my head) and as my foot stuck, it pulled my right leg back behind me and hyper-extended my knee, big-time! The MRI results should be back by Friday. It is feeling much better though! I’ve been on steroids (prednisone) and it’s feeling less and less sore. I’ve been afraid I tore my MCL. But, I’m believing it’s getting better! I appreciate all the prayers! Even Josh and Katy were home that weekend and got in on the act! 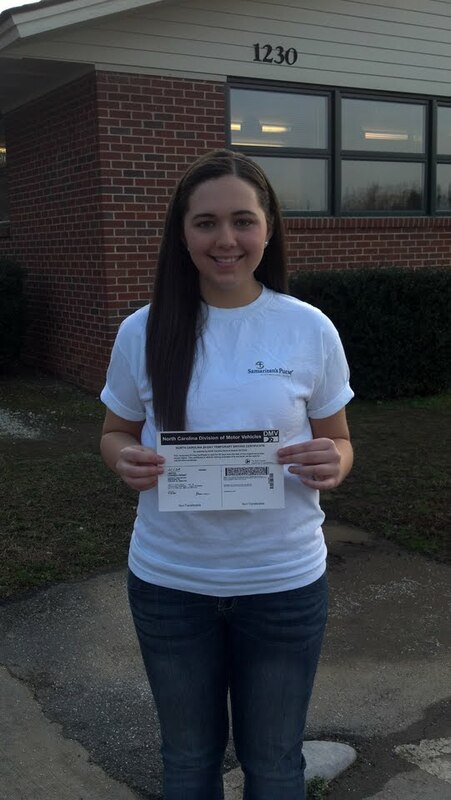 In other news, Kandace recently got her limited permit. She turned 15 last week! Unreal! Now she’s “driving up a storm!” Drivers beware! 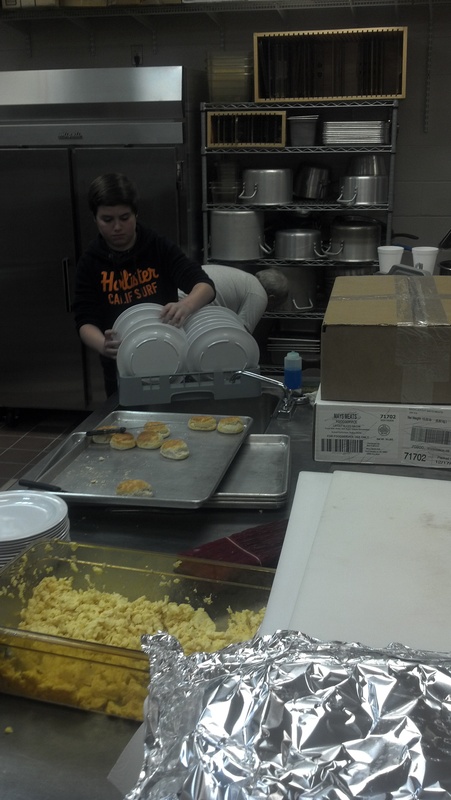 Here’s a couple of great pictures of our young adults serving and working in our kitchen at church on Wednesday nights. 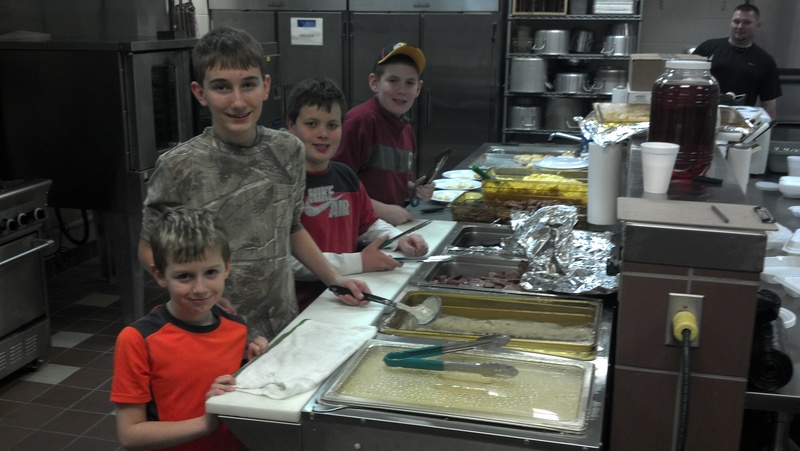 They served the entire meal last week including washing all the dishes! The Bible never speaks of a season of adolescence where kids can meander off in a period of peer-driven frivolity. Instead, the Bible speaks of “children” and “adults.” That’s it. Jesus at the age of 12 said, “Didn’t you know I had to be about my Father’s business.” At age 12, Jesus was a “young adult” in my mind. He is our example to follow in all of life, including age 12. Paul said in 1 Corinthians 13:11 “When I was a child, I spoke and thought and reasoned as a child. But when I grew up, I put away childish things.” See any mention of adolescence there? The term “teen” or “teenager” didn’t exist until approximately 60 years ago. We have lowered our expectations for our kids and the problem is… THEY WILL SELDOM EXCEED OUR EXPECTATIONS. So, why set the bar low. Set it high! 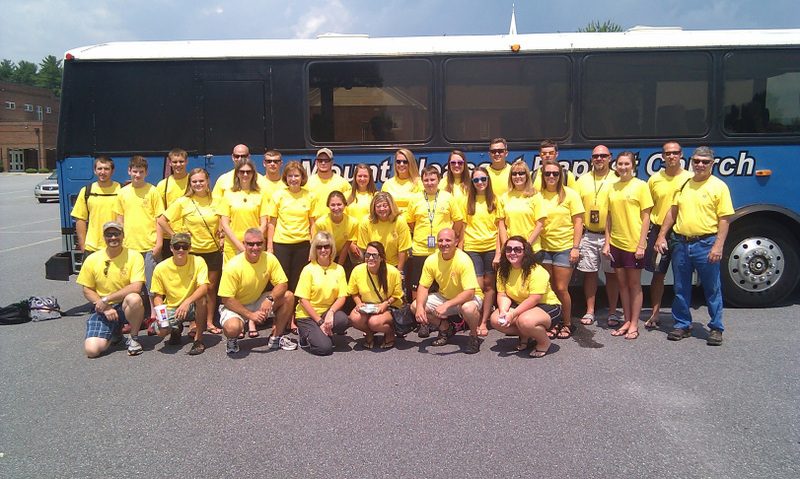 We want the young adults (as we call them…I don’t like the term “youth”) with us on mission trips and in the services. The family worships together in Scripture always! Never is the family separated during the meeting or gathering of the believers. You NEVER find this in Scripture. So, at our church…there is no nursery…just a “cry room.” Just get the children settled down if you need to and bring them back into the service. We did this with Andrew and Clara right after their adoptions. They were terrible for a few Sundays, but they soon learned. You know children will learn when we expect them to, won’t they? 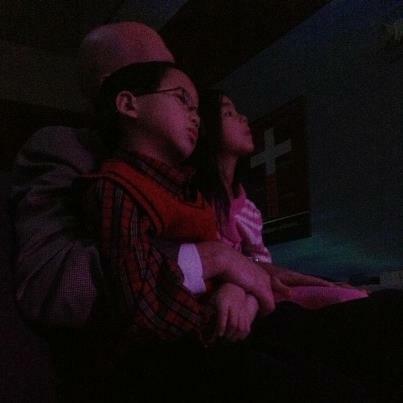 Here’s Clara and Andrew on my lap this Sunday as our wonderful Praise Team was playing/singing. 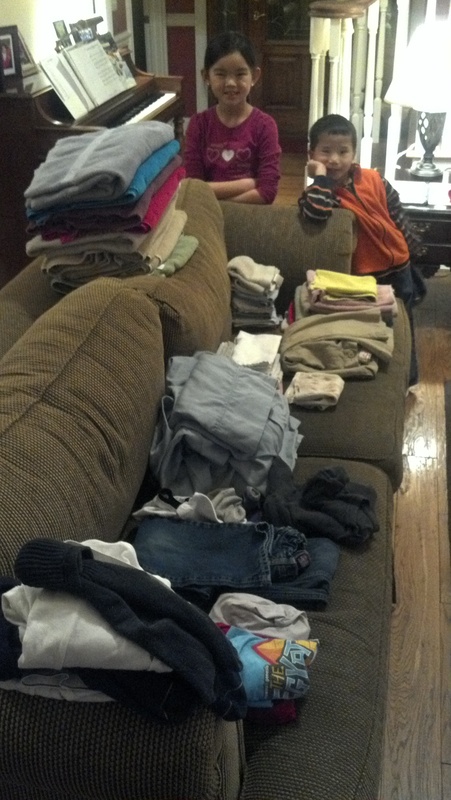 Here’s Clara and Andrew folding clothes. What do they get paid? Nothing! Why should they? You say, “Should you get an allowance.” Well, as I heard one man say, “I allow them to live my house and eat our food and wear the clothes we buy them.” Ha! Ha! 🙂 Now I’m not meaning to be crass or brazen. I give my children money from the cleaning job we perform each week (outside the home) at a local business/office. They get to learn how to save, spend and give (to the church and benevolent needs that we give to as a family). They are to be productive children in our home. We are not going to bring up children who expect a “handout” just because they are alive. That’s short-sited and teaches and exudes the wrong message. Paul said to Timothy, “If a man won’t work, let him not eat.” So, should children get paid to help around the house as part of your family? You decide. But, I’ll ask you this: Do you get paid to do your laundry? 🙂 If you do, let me know who’s standing at your door with a check or cash! I want to come to your house and live with you! Want to hear a super Praise Team! Check out our folks who lead us in worship each week under the leadership of Pastor Brad Cordray! Awesome!